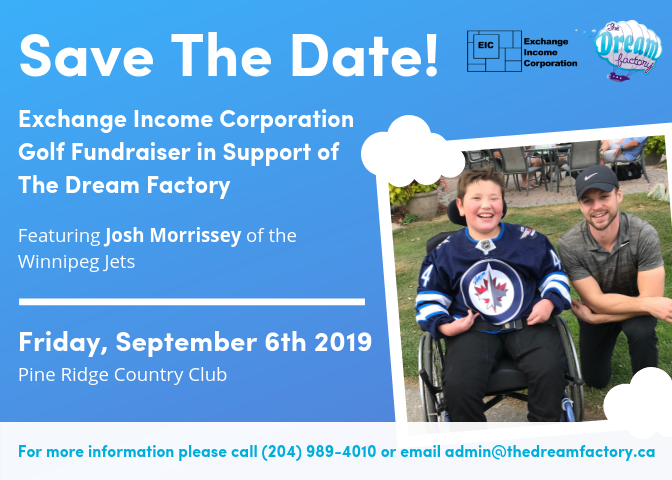 We could not be more excited for the 2nd annual Exchange Income Corporation Golf Fundraiser in Support of The Dream Factory. Last year’s event was a great success, and helped many more dreams come true for brave Manitoba Kids battling life-threatening illnesses. This year’s event will once again take place at the beautiful Pine Ridge Golf Course, with on-course activities provided by many of our fabulous sponsors, amazing prizes in our live auction, and knowing that your participation is helping bring dreams to life. We are very honoured to have our Dream Factory Ambassador, Josh Morrissey joining us once again at this year’s tournament. Josh has quickly become an incredible supporter of The Dream Factory, and always goes above and beyond to make dreams come true. For more information, please contact The Dream Factory at (204) 989-4010 or by email at admin@thedreamfactory.ca.